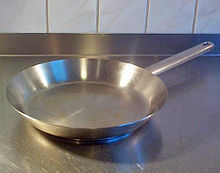 A frying pan or skillet is a shallow cooking utensil generally used on top of a cooktop for frying food. As with all pans, a thicker bottom allows more even heat distribution while reducing responsiveness to desired heat changes. See the pots and pans article for a discussion of the different materials that may be used. This page was last edited on 28 February 2010, at 23:19.